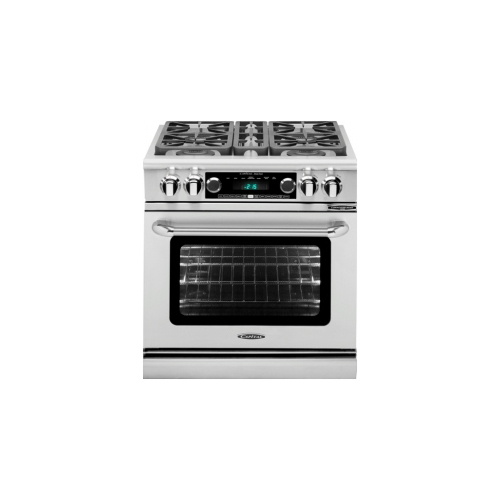 �AVANTI � 20"" GAS RANGE � �STAINLESS STEEL � �APAV2013SS �� Automatic Electronic Ignition �� See-Thru Glass Oven Door �� Oven Cavity Light �� Waist High Broiler �� Bake / Broil Oven for Maximum Versatility �� Four Sealed Type Burners: �� (1) Rapid (2) Semi-Rapid (1) Simmer �� Backsplash �� Storage Drawer �� Leveling Legs �� Two (2) Oven Racks �� LP Conversion Kit Included �� Broiling Pan Included �� ADA Compliant. 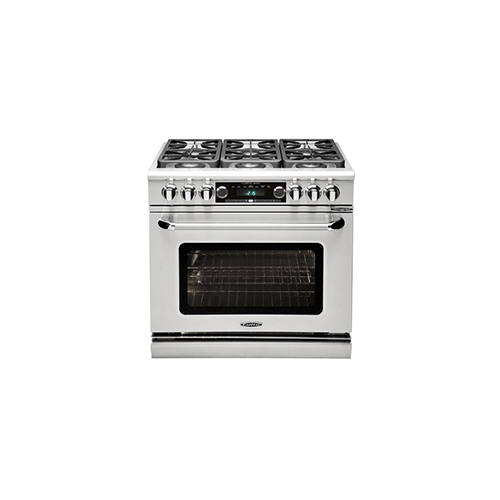 Enjoy a home-cooked meal with ease using this gas range, which features bake and broil options in the 2.2 cu. ft. oven. Four sealed burners simplify cooktop cleanup, and a built-in drawer offers extra storage. Freestanding Range>Oven Light>Two (2) Oven Racks>LP Conversion Kit Included>Broiling Pan Included>ADA Compliant This item cannot ship to APO/FPO addresses. Please accept our apologies. 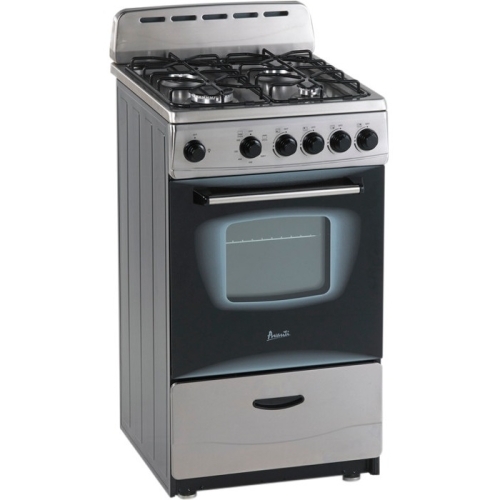 Freestanding 24" Gas Range>Automatic Electronic Ignition>See-Thru Glass Oven Door>Oven Cavity Light with ON/OFF Switch>60 Minute Timer>Waist High Broiler>Bake / Broil Oven for Maximum Versatility>Four Sealed Type Burners:>(1) Rapid (2) Semi-Rapid (1) Simmer>Backsplash / Storage Drawer / Leveling Legs>Oven Rack / Broiling Tray Included This item cannot ship to APO/FPO addresses. Please accept our apologies. 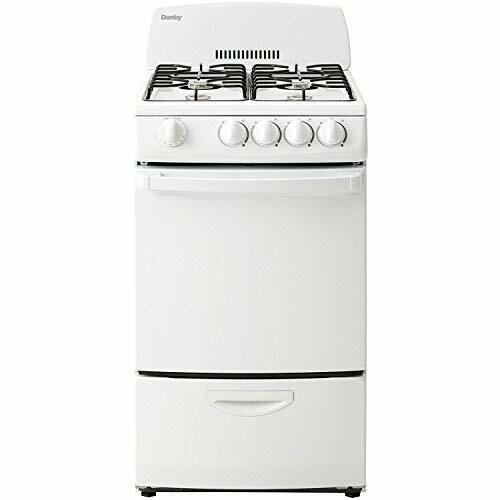 AVANTI 20" GAS RANGE� WITH OPEN BURNERS� WHITE� APAV20GWH Freestanding 20" Gas Range Broiler Drawer Automatic Electronic Ignition Full Range Temperature Control Push and Turn Controls Solid Metal Oven Door Bake / Broil Oven for Maximum Versatility Four 9,000 BTU Cooktop Burners Oven / Broil Burner : 10,000 BTU Backsplash / Storage Drawer / Leveling Legs Oven Racks / Broiling Tray Included LP Conversion Kit included . 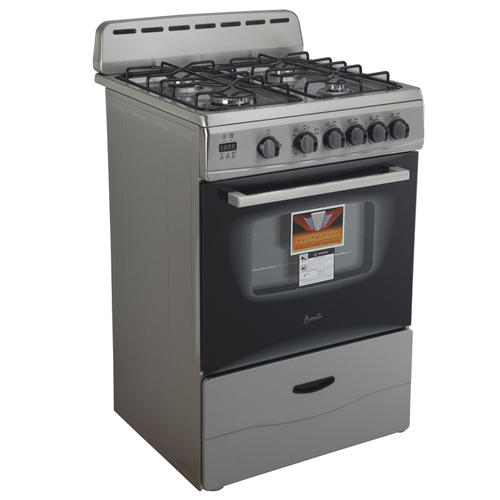 AVANTI 24"" GAS RANGE� BLACK� APAV2415BK Freestanding 24"" Gas Range Automatic Electronic Ignition See-Thru Glass Oven Door Oven Cavity Light with ON/OFF Switch 60 Minute Timer Waist High Broiler Bake / Broil Oven for Maximum Versatility Four Sealed Type Burners: (1) Rapid (2) Semi-Rapid (1) Simmer Backsplash / Storage Drawer / Leveling Legs Oven Rack / Broiling Tray Included� . 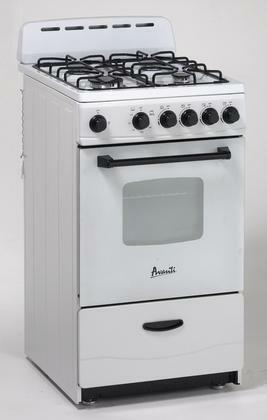 AVANTI 24" GAS RANGE� STAINLESS STEEL� APAV2416SS Freestanding 24" Gas Range Automatic Electronic Ignition See-Thru Glass Oven Door Oven Cavity Light with ON/OFF Switch Digital Clock and Timer Waist High Broiler Bake / Broil Oven for Maximum Versatility Four Sealed Type Burners: (1) Rapid (2) Semi-Rapid (1) Simmer Backsplash / Storage Drawer / Leveling Legs Oven Rack / Broiling Tray Included . 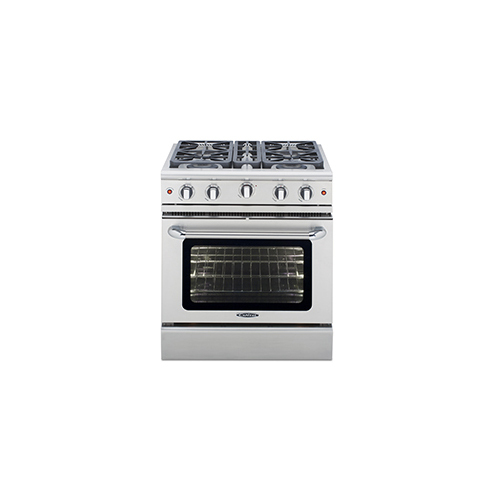 Connoisseurian Ranges combine the most powerful range top burners available for domestic use with all the innovative features of Capital’s electric oven, including the groundbreaking Moist mode. 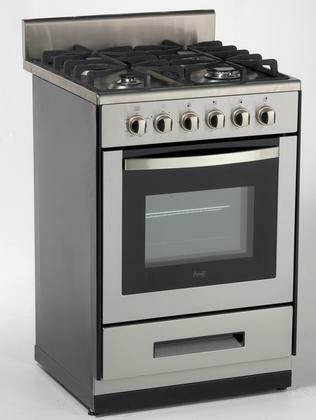 The result is a range that delivers the ultimate in professional performance for the home cook. 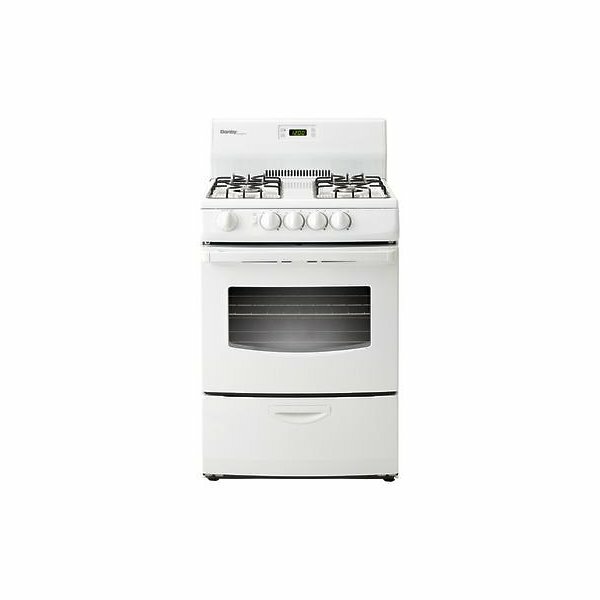 Connoisseurian Series 30" Dual Fuel Range Self Clean Convection 3 Open Burners 25K BTU Plus 1 8K BTU Small Pan Burner Natural Gas BAKE, BROIL, ROAST, DELICATE BAKE,PERFECT CONVECTION & MOIST COOKING>MEAT PROBE cooking (all ovens)>Convection Fan cooking for BAKE, BROIL, ROAST> Hidden Bake Element under glassfor easy clean up and efficient oven heating>Ribbon Broil Element under glass results in BBQ-quality searing>Two-speed cooling fan system>Dual air-flow convection> Extra large viewing oven window>Dual Kitchen Timers (5 secs – 11 hours 55 mins)>TIMED COOK – You can set the oven to turn itself OFF after a set amount of time This item cannot ship to APO/FPO addresses. Please accept our apologies. 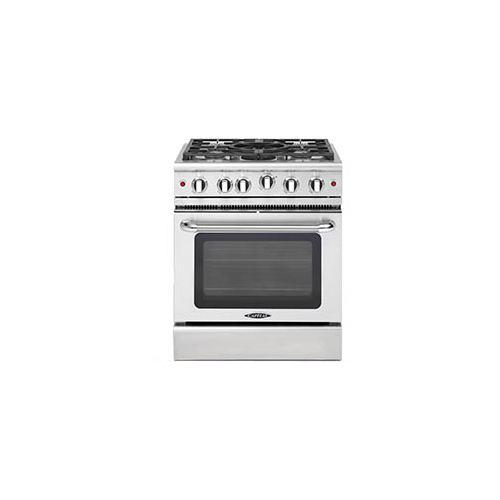 Precision Series 30" Manual Clean Range with 4 sealed burners rate at 19,000 Btu each Stay-Cool Die Cast, Chrome Plated Knobs>Large viewing oven window>Large Capacity Oven This item cannot ship to APO/FPO addresses. Please accept our apologies. 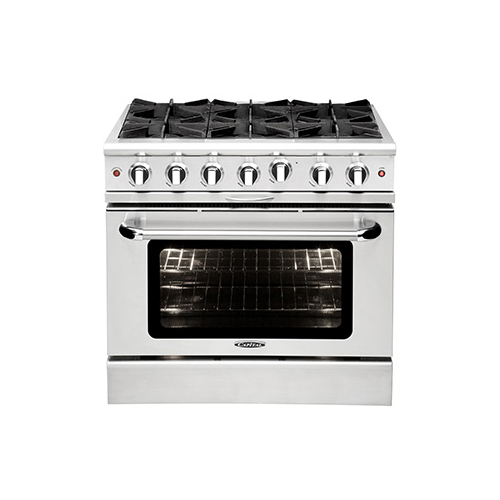 Precision Series 30" Manual Clean Range with 4 Sealed burners rated at 19,000 Btu each and 1 Power Wok burner rated at 25, 000 Btu burner Stay-Cool Die Cast, Chrome Plated Knobs>Large viewing oven window>Large Capacity Oven This item cannot ship to APO/FPO addresses. Please accept our apologies. 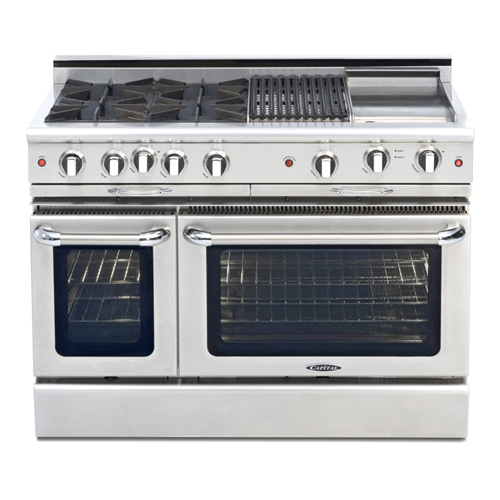 Connoisseurian Series 36" Dual Fuel Range with 5 Open burners rated at 25,000 Btu each and 1 Small Pan Open burner rated at 8,000 Btu Integrtaed Rotisserie Cooking>Meat Probe Cooking>Moist Assist Cooking This item cannot ship to APO/FPO addresses. Please accept our apologies. 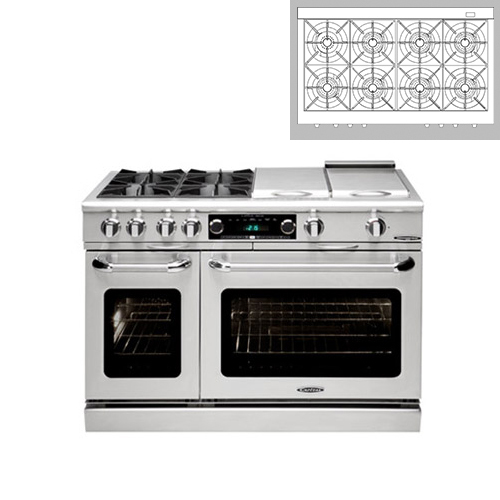 Connoisseurinan Series 36" Dual Fuel Range with 6 Sealed burners rated at 19,000 Btu Integrtaed Rotisserie Cooking>Meat Probe Cooking>Moist Assist Cooking This item cannot ship to APO/FPO addresses. Please accept our apologies. 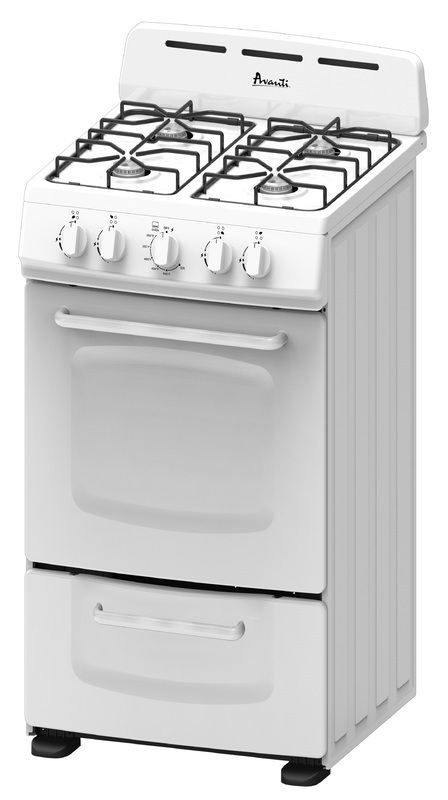 Culinarian Series 36" Gas Self Cleaning Range with Rotisserie in Oven 5 Open Burners 25K BTU and 1 Small Pan Burner 8K BTU Natfural Gas Powerful OPEN TOP BURNERS RATED AT 23,000 BTUs/hr for All Burners>All burners are capable of turning down to provide True Simmer of 145°>CAST IRON WOK GRATE available as an accessory.>Thermo-Griddle™- 18,000 BTU, 3/8" thick thermostatically controlled>Stainless Steel Griddle Plate This item cannot ship to APO/FPO addresses. Please accept our apologies. 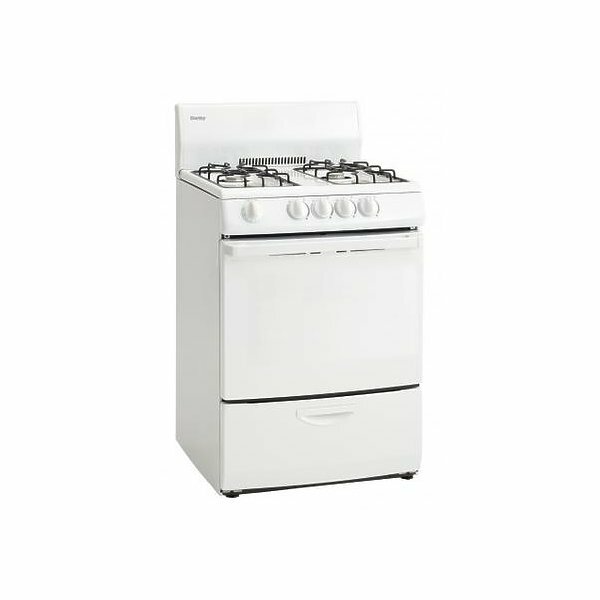 Capital 36" Gas-Conv 4 Burner Ranger NG 140 deg. simmer - 19,000 BTU Power-Flo burners (sealed)>18,000 BTU Infra-Q infrared Barbecue grill>Convection oven>Convection oven>4.6 Cu Ft oven cavity This item cannot ship to APO/FPO addresses. Please accept our apologies. 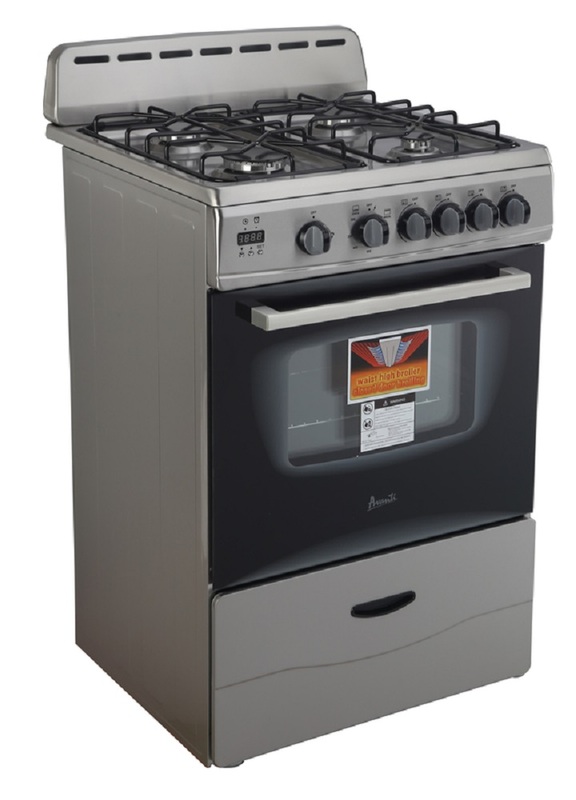 Connoisseurinan Series 48" Dual Fuel Range with 8 Sealed burners rated at 19,000 Btu each Integrtaed Rotisserie Cooking>Meat Probe Cooking>Moist Assist Cooking This item cannot ship to APO/FPO addresses. Please accept our apologies. 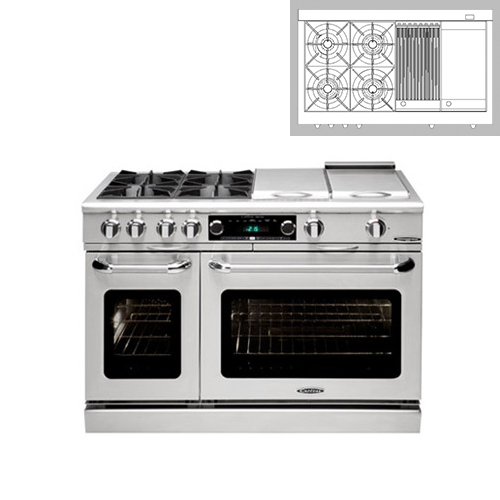 Connoisseurian Series 36" Dual Fuel Range with 5 Open burners rated at 25,000 Btu each, 1 Small Pan Open burner rated at 8,000 Btu a 12" Broiler Burner and a 12" Thermo-Griddle Integrtaed Rotisserie Cooking>Meat Probe Cooking>Moist Assist Cooking This item cannot ship to APO/FPO addresses. Please accept our apologies. 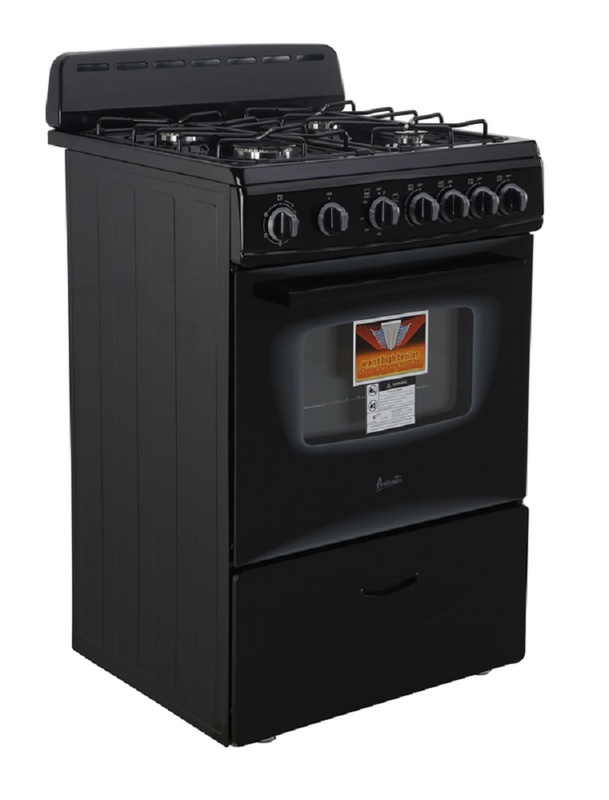 48" Pro-Style Gas Range with 6 Open Burners, True Simmer, 18K BTU Thermo Griddle, 4.6 cu. 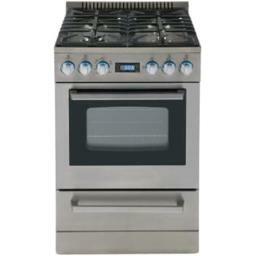 ft. Convection Oven with Rotisserie, 2.1 cu. ft. Secondary Oven, Self Clean, Infrared Glass Broiler and Titanium Speck Porcelain Oven Interior. Capital - The Power of Performance Distinctive Performance. Sublime Elegance. Lasting Quality and Value. The qualities that make up a company are as important as the products they create. Capital prides on going the extra mile. By paying closer attention to the details that make up each single item they create, they've blurred the line between engineering excellence and beautiful design. They also believe that the quality of customer service is just as important as product quality, that's why they work harder to make it pleasurable and prestigious to own a Capital appliance. Powerful Open Top Burners rated at 23,000 BTUs/hr for All Burners>12" Stainless Steel Thermo Griddle rated at 18,000 BTU>All burners are capable of turning down to provide True Simmer of 145°>EZ-Glides - Full extension removable drip trays mounted on ball bearing rails.>Auto-ignition/re-ignition on all open top burners>Commercial Quality Cast Iron Grates with easy to clean matte porcelain finish This item cannot ship to APO/FPO addresses. Please accept our apologies. 48” CULINARIAN MANUAL CLEAN GAS RANGES. For Those Who Love To Cook! 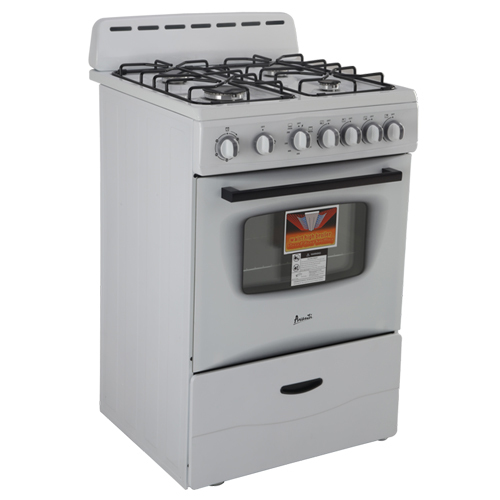 Powerful 23,000 BTU’s/hr Open Burners all turn down to a delicate constant simmer. Stainless steel spill pans and spill trays let you take clean-up to the sink .Thermo-Griddle and BBQ Grill burner options available. 4.9 cu. ftcapacity primary oven fits a full size commercial cookie sheet and the 2.7 cu. ft. companion oven fits a commercial half sheet pan! 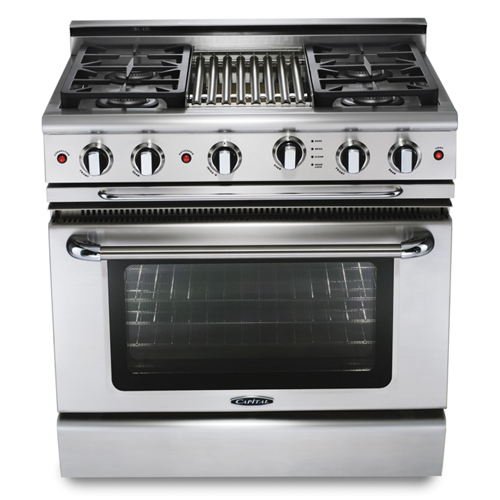 BAKE, BROIL, and CONVECTION modes to meet all your cooking requirements. Flush rear trim for island friendly installations. 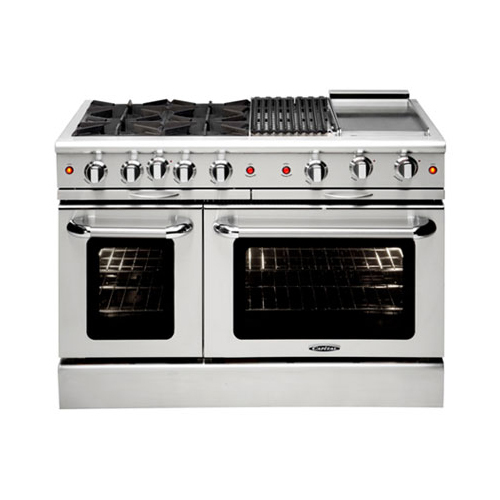 Powerful and efficient 23,000 BTU Open Burners with professional porcelain coated cast iron grates meet all your cooking needs>All burners adjust down to a delicate constant simmer>All burner have auto ignition and re-ignition>Primary Oven Size: 27”W X 21”D X 15H. 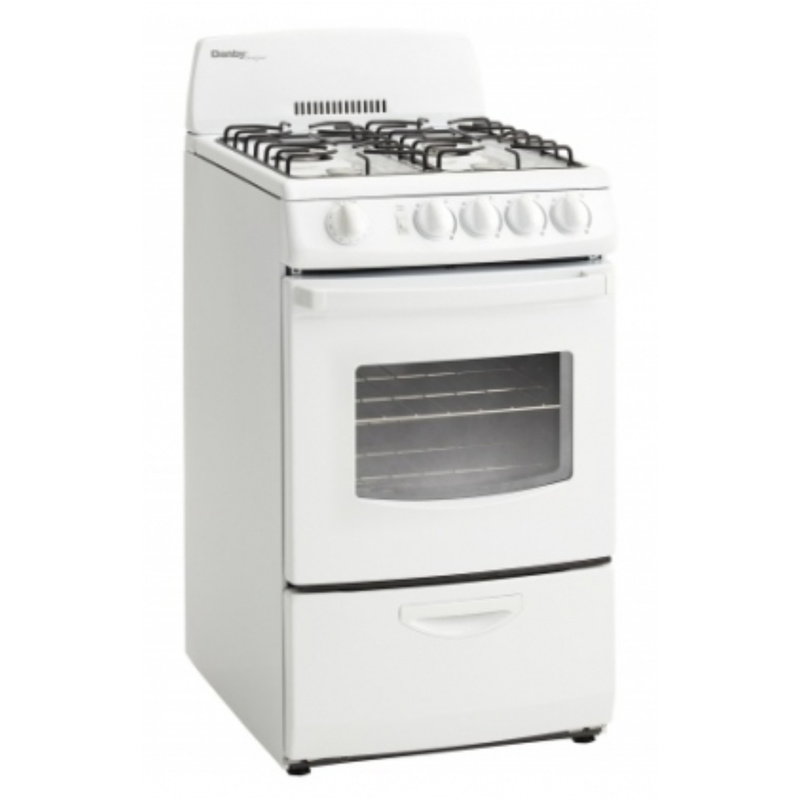 4.9 cubic feet>Companion Oven Size: 15”W X 21”D X 15”H. 2.7 cu. ft.>5 rack positions with two racks provided per oven>BAKE, BROIL, CONVECTION BAKE>Flush oven bottom>Infrared Broil burner for quick searing or indoor grilling This item cannot ship to APO/FPO addresses. Please accept our apologies.